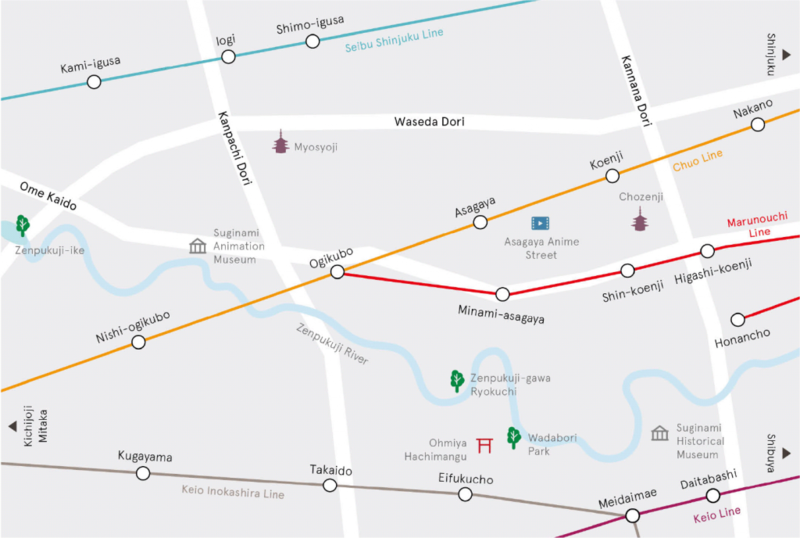 Neo House Tokyo is located in Suginami-ku which is conveniently located in central Tokyo. Suginami-ku also has a lot of parks, retro shopping streets, and modern art galleries. While the city is near the central Tokyo, also you are also able to experience retro Tokyo life. Counter culture is rooted in Suginami area, and as exhibited by the many new ateliers and galleries opening recently, the town has an exciting cultural atmosphere developing. Ateliers and galleries are used not only for showcasing art, but also as a social meeting place among artists and local residents. There are 140 shopping streets in Suginami area. You can experience the retro life style sounded by small local stores. Looking at vegetables in a green grocery store will be fun. There are also a lot of Japanese deli stores. This is especially great for people who are living alone and want to easily enjoy a Japanese home-made dish. One of Japan’s many enticing traditional festivals. Awaodori is a big event which has grown to attract a million sightseers and gather the entire town together in excitement. Suginami has a lot of beautiful green parks along the river. One of which is renovated from a historical residence and looks like a Japanese garden. In Spring time there are cherry blossoms, and in autumn comes crimson red leaves. This is perfect for taking a leisurely walk under the trees. Popular restaurants with long lines at all hours. Retro mom-and-pop restaurants serve exceptionally tasty ramen. You can enjoy the many flavors of Ramen. Suginami is known for local Japanese pubs called Izakaya which keeps its fans coming from all over Tokyo. Many Izakaya have only a counter table which keeps things fun and lively as people excitedly chat with the pub owner and other friendly strangers in the bar. While Suginami is located in the center of Tokyo, there are many deep green temples. They are open for everyone and it is possible to go in a main hall. Suginami has about 65 antique shops and this is the greatest number among Tokyo main districts. Antiques are a part of fashion and culture in Suginami, and are a massive reason why the traditional and young culture can mix well in this area. My hometown Suginami, Koenji area has a lot of festivals like Awaodori in a year. The whole town is helping to make it fun for people from different countries. There are 12 temples around Koenji and we are trying to build a friendly atmosphere. We are happy if French visitors could enjoy this beautiful Suginami. I live in Nishi-Ogikubo which locates only 15 minuites directly from Shinjuku station. From textiles to pottery to used kimonos and books, there are little shops throughout Nish-Ogikubo which make the neighborhood intimate and special. The neighborhood is very vibrant with local artists in many fields. For me Suginami-ku strikes the perfect balance of being both urban and vibrant yet also quiet and mellow. You can wander through its scenic residential streets, visit the numerous idyllic parks and cafes, or if you’re feeling more adventurous, hit one of the many independent bars which are scattered ubiquitously along its streets. Close enough to Shinjuku to be considered “central” yet, not close enough to be insanely busy.